The Inventory Wizard provides a quick and easy way to go through all of your unconfigured listings and allow you to make quick decisions for each of them, like creating new items or kits or linking the listings to existing items or kits. Create new item: If the listing represents an item that has not been added to your SKULabs catalog yet, you'll want to create an item to link it to. The item will need a unique name, SKU, and barcode, and you can add an optional location as well. 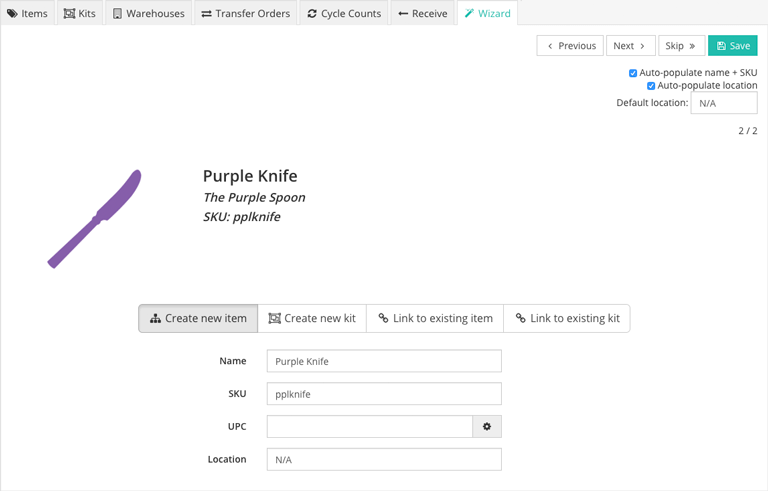 Create new kit: If the listing represents more than one item, and that kit has not been added to your SKULabs catalog yet, you'll want to create a kit to link it to. The kit will need a name and its contents, which can be made up of new or existing items of varying quantities. Link to existing item: If the listing represents an item that already exists in your SKULabs catalog, you can search for that item and connect it to this listing. Link to existing kit: If the listing represents more than one item, and that kit already exists in your SKULabs catalog, you can search for that kit and connect it to this listing. Previous: If you want to make changes to the previous listing in the wizard's list, select this to go back to that listing. Next: If you are finished linking this listing to an item or kit, you can select this to continue to the next listing in the wizard's list. Skip: If you want to make changes to the next listing in the wizard's list, select this to skip the current listing and continue to the next listing. Save: If you are finished linking listings to your catalog for now, select this to commit those changes and return to your catalog. Auto-populate name + SKU: When enabled, this will automatically fill in the name and SKU of a new item with those of the listing. You are still free to modify these fields as needed. Auto-populate location: When enabled, this will automatically fill in the location of a new item with the value entered below ("N/A" by default). You are still free to modify each new item's location as needed.